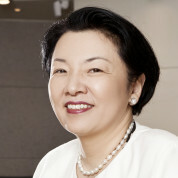 Heekyung (Jo) Min is the Executive Vice President and Executive Director of CSV Management of CJ Corporation in Korea. Her role as a business leader and social innovator is to create a sustainable future for CJ Group by driving and coordinating CSV and CSR efforts. She oversees CJ’s core values that accelerate the social and business innovation. Her commitment to creating shared value was developed through her experience in both government and private companies with extensive experience in HR, Finance and Intercultural Management. In her role as the Director General of the Business Opportunity Bureau at the Incheon Free Economic Zone (IFEZ) in Incheon, Korea, she was responsible for promoting Korea to the global society. Her experience in the financial sector in New York, Tokyo and London includes the Bank of New York, The Apogee Finance Group, UFJ Tokyo-Mitsubishi (formerly Sanwa) and Prudential Investment and Securities, and Deloitte & Touche in New York. She holds an MBA in Finance and Accounting from Columbia University, and a BA in Music from Seoul National University. Ms. Min speaks and writes extensively in Korea and internationally on large corporations’ social responsibilities.